USC. NYU. UCLA. All universities that are known for having esteemed film schools. What about Florida State University (FSU)? FSU is home to a unique and robust film school, graduating students who have gone on to create movies like Moonlight, Spotlight, and 12 Years A Slave. Up until 2017, however, not many people had FSU Film School on their radars. Why? Because their story had never been properly told. Even The Hollywood Reporter, which puts out a ranking of the top 25 film schools in the U.S. each year, wasn’t completely aware of FSU and had ranked them at #24 in 2016. The team at FSU knew that they needed to tell their story. And the timing was perfect. Moonlight, a film created by 7 FSU Film alumni, was making waves in the film industry with an Academy Award nomination for Best Picture. That’s when FSU’s Dean of the Film School, Reb Braddock (along with the exiting Dean Frank Patterson), engaged the Vista team to help raise their awareness both with media publications and potential students. At Vista Growth, we approach storytelling with one basic principle—start with the truth. No hyperbole. No claims. Just the simple truth. With FSU Film, we gathered their distinctive, authentic strengths. What makes them better, different, special from other film schools? What about their program is especially attractive to potential students? The FSU Film team provided a lot of really compelling nuggets, including that there is a 5 to 1 student/teacher ratio, the University covers production costs for the student films, and 97% of FSU Film graduates are working in the industry within one year of graduation. We also interviewed alumni, who provided rich commentary and examples on how FSU Film enabled and prepared them for a career in Hollywood. These messages were printed in an FSU Film School hardcover book and sent to a select and targeted audience including the editors of The Hollywood Reporter. Sometimes a well-placed piece of print works. 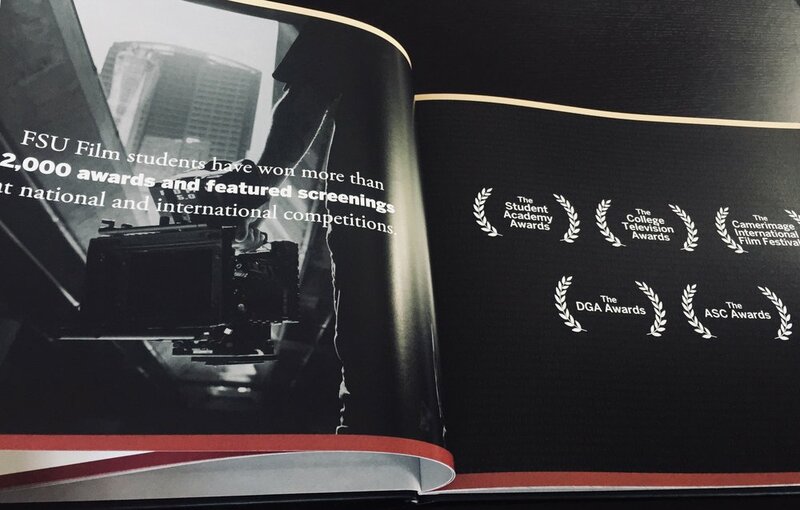 After gathering and distilling the most compelling info and stats, we took the next natural step in storytelling—together with FSU Film, we created a hardcover book that graphically and simply stated the attributes of the film school that paint a picture of their story. And as luck would have it (really, luck was not to credit here, it was the film production’s talent), Moonlight won Best Picture at the Academy Awards, allowing us to include this impressive and timely accolade in the narrative. With that, we sent the book to The Hollywood Reporter and a few other publications in the industry. In August 2017, the rankings were in. It was the moment of truth. With as much anticipation as finding out the winner of the Academy Award for Best Picture, the FSU Film School discovered that they moved up 4 spots to #20 in The Hollywood Reporter’s film school rankings—all in just one year. And they’ve continued to move up in the rankings, being #19 this year. Congrats to the FSU Film team. The power of strategic storytelling is cause and effect. If your brand’s story isn’t known, people can't rally behind it. And even worse, sometimes your competition will tell your story for you and it may not be favorable. So we always recommend being proactive and putting your story in the spotlight. Hats off to the FSU Film leadership for seizing the moment and engaging us to help amplify their story. Sign up with your email address to receive Vista Insights. We respect your privacy and will keep your e-mail address confidential.